Sweet Science: Chocolate Myth vs. Fact. I admit that despite having the “RD” credential after my name, I indulge in a chocolatey treat at least once or twice a week. If you follow our blog, you’ll know that there are no forbidden foods here. Of course like any sweet, chocolate should be consumed in moderation. You don’t want to run out to have a pound of chocolate every day. Although, sometimes that may seem like a good idea! At least to your taste buds. Since we often feel guilty for our cocoa indulgences, I felt compelled to plead a case on behalf of this once-in-awhile treat. I kind of know all of this, but appreciate having all of the facts and figures to work with. 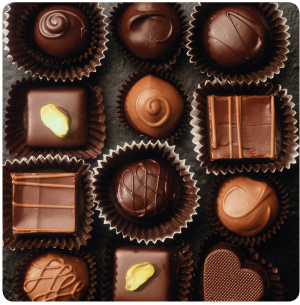 Chocolate has got be wrapped around its little finger as they say, and love to talk about how healthy it is.! I saw a cooking video the other day that suggested melting a few squares of dark chocolate in a microwave bowl and then tossing it with fresh strawberries. Simple, yummy! Great article Katherine. I learned a lot from this. I had heard and believed that chocolate had to be at least 70% cacao to be good for you. Thanks for clearing up the myths v. facts. wish it were valentines day right now! Yumm, there’s always a reason to eat chocolate and I love dark chocolate! Anything 80% or higher! Another way to enjoy chocolate that’s healthy for you is to make raw fudge balls made with dates, natural cocoa powder and walnuts, pecans or other nut. Raw fudge balls contain healthy fats from the walnuts; flavanols from the cocoa and all natural sugars from the dates. It’s a guilt free treat at less than 50 calories per fudge ball and for some reason, in comparison to regular chocolate bar or chips, I do not crave more. One is satisfying enough. Only a small amount of dark chocolate for me daily for it’s health benefits. It’s an acquired taste but if you want to be healthy, you gotta eat healthy.